Earlier today, I mailed a chevron block each to Helen, Jude, Karen, Kate, Madison and Shelley. I hope you like my block and all the blocks you receive. I was thinking about my process while I was at the post office today and talking with the postal clerk about how I am mailing stuff like this every month and how I work hard to keep the envelopes as flat as possible so they can travel as “letters” and not “parcels.” Today he asked what the “little bump” he could feel were, but when he put it through that measuring slot, they were thin enough to pass through. As I was driving back, I wondered if I had included all the little things I do to keep the postage as low as possible in the old blog post I link in the email with the mailing info: Mailing Squishies. I just checked and this is still exactly how I do it. Today I mailed 6 envelopes (each containing one block and a letter) to 4 of the winners in the US, Karen in South Africa and Kate in England for $4.52. Postage rates have gone up a bit over the years of the Block Lotto and will likely continue to do so. I completely understand when people decide the cost of postage isn’t worth it for them and they decide to no longer participate. But, I would gently suggest that, especially for those in the US, complaining about mailing to international winners really isn’t appropriate here. We are an international group, but are mostly in the US. This means that most winners most months are in the US and that everyone everywhere else is likely paying international postage to send blocks to the US every month … and I have never seen a complaint from any of them posted here. Even with the jump in prices this week, 1st class mail is still a deal. I learned from the 1st batch of blocks that I won several ways to reduce bulk. The easiest was fold each block then to wrap the lot in clear or self adhesive plastic wrap. I’d used zip lock bags and the bump was a give away. I’ll be looking for air mail paper , too. However, I think the cost of a postcard is worth it and I love sending blocks out of the country. 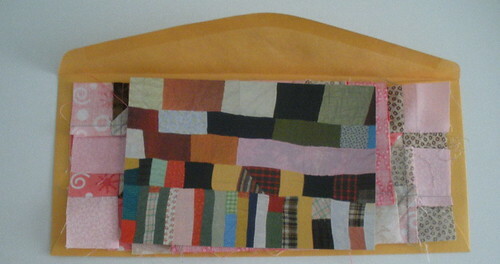 I wish best of luck to the International quilters & hope to send blocks your way. If I can’t travel as I’d like to, at least I can have blocks traveling. I think it is exciting to be shipping blocks overseas. Spread the love I say! I have not found the Canadian postage to the USA a problem but, when I received your beautiful blocks ladies I began to wonder if I had put on enough postage…never was I charged $9.00 for three blocks…if anyone has had a problem with my postage please let me know and I will settle up immediately!